It was 10 years ago when we were last in Halifax. At that time we had landed here to start a multi-week driving trip through four provinces before returning home. That trip still stands out in our memories as some of the most spectacular sights in our own country. But we left out one important province that we didn’t get to see and since that day we vowed one day to correct that mistake. I bring you Barb and Baden’s Newfoundland Adventure. Friday night around midnight we boarded a flight out of Vancouver and over 5000 Km of flying later we landed in Gander, Newfoundland yesterday afternoon. Another few hours of driving got us to our first destination of Twillingate. We hardly got any sleep last night on the overnight flight and we’re now having to get over the 4.5 hour time difference between Vancouver. We’ve only been in Newfoundland for about 5 hours now and all we want to do is get some sleep. But there’s a reason why we started our Newfoundland Adventure here in Twillingate. It’s the ice. 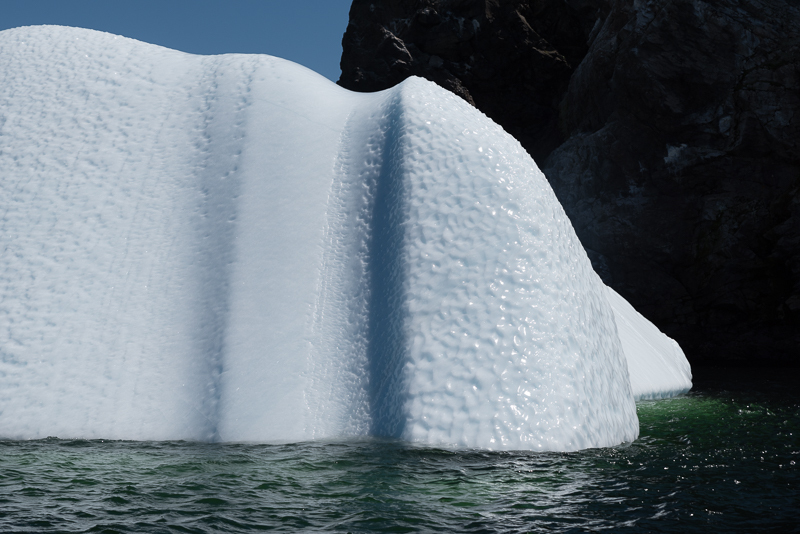 Twillingate bills itself of the Iceberg Capital of the World and after today we can see why. There are icebergs everywhere. Many months ago we discovered that during the spring to summer months huge icebergs break off from glaciers around Greenland and start to float south, passing right by Newfoundland. Icebergs in summer floating within eyesight of our next travel destination? Sign us up! This morning we woke up to sunny skies and warm weather in the mid 20’s. There’s still a cool breeze so it never really got uncomfortably hot. 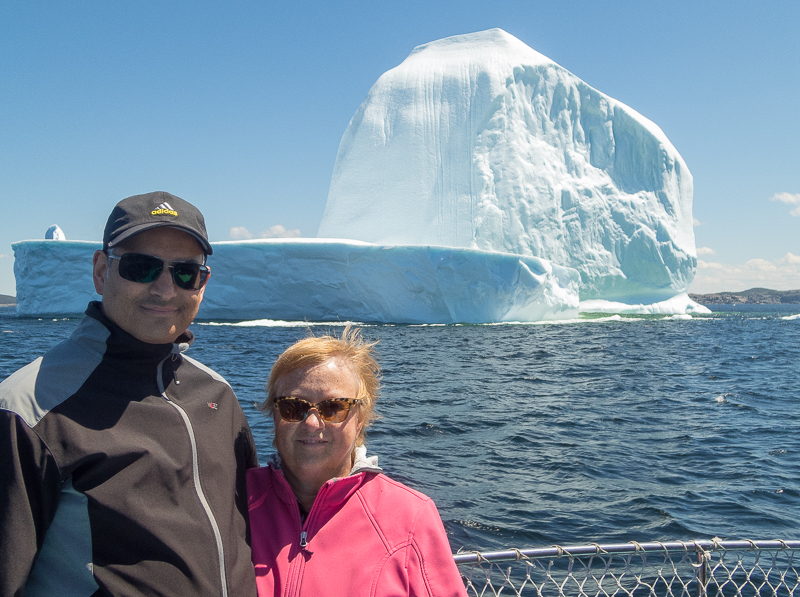 Today might well be the highlight of our entire Newfoundland Adventure as we had arranged to be on a boat to take us out to the icebergs. From the window of our B&B we could see icebergs floating in the harbour and we were already pretty excited to see those. However, the boat ride around the island this afternoon was incredible. We got very close to many icebergs, one of them (top photo above) was over 200 ft tall! Some of them were multiple colours and some were textured, clearly visible in the sun. We were out on the boat for two hours and the time went by very quickly. 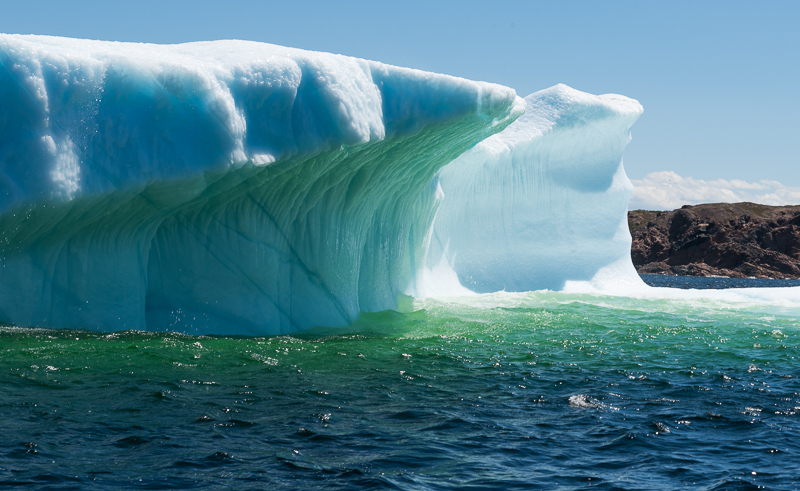 Iceberg tours in Twillingate seem to be very popular and there are several boat tour companies from which to choose. However, it’s not overrun and in the two hours we only saw 1 or 2 other boats. It’s only our second day in Newfoundland and we’ve already had a lot of fun seeing the sights and the people here couldn’t be friendlier. We have another 8 more days in our trip and we hope that the remaining days life up to this one. The 2nd part will be posted in a few days. I’ve started to post my Newfoundland photos to my photo web site. I’ll continue to add more as the trip continues. Spectacular photos, Baden! I knew we should have done Newfoundland on our previous trip East. Looking forward to the next instalment. Wow! Incredible! We hope to get there one day too, so your information is very timely for us. We look forward to what’s to come! Enjoy yourselves! How wonderful. Enjoy ! Looking forward to more pics.